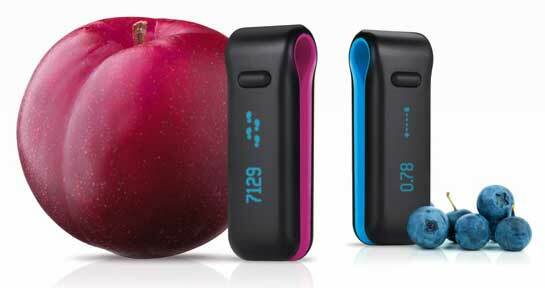 What is the Fitbit Wireless Activity Tracker? is, at its core, an electronic pedometer. Clip on it on your clothing, or simply place it in your pocket, and it counts your steps. The Fitbit also has an altimeter built in, that, according to a standard building measurement, counts how many floors you climb during the course of your day. Lastly, inside the Fitbit is an accelerometer, that detects movement in order to rate the quality of your sleep. What follows below is probably the most immersive review I’ve ever written. At the time of writing my Fitbit and I have logged 446,548 steps together, in just over five weeks. 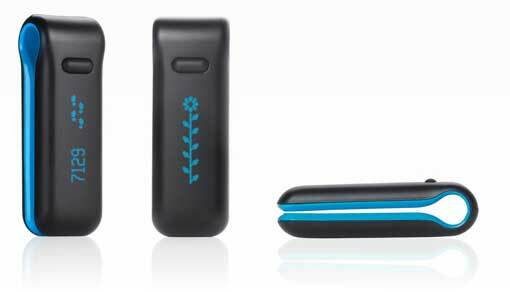 What does the Fitbit Wireless Activity Tracker look like? The Fitbit is made of black plastic, and is in the form of a tight u-shape. 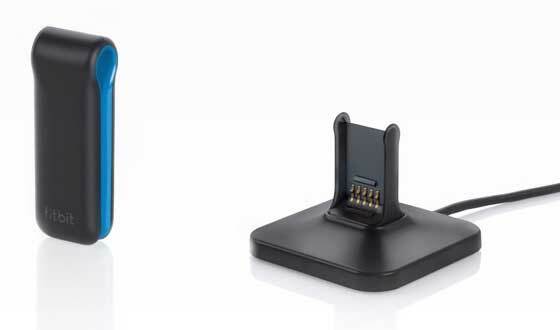 The u-shape works both as a clothes clip, and to fit over the base station used to upload your data via your computer. It is available in two colours – black with a blue trim, or black with a plum trim. Out of the box, the Fitbit is very easy to setup, and the process does not take very long at all. All you need do is remove the Fitbit from the box, and connect it to your computer via your computer’s USB and the supplied base station. Your then follow the onscreen instructions and setup your account via the Fitbit website – name, height, weight, etc. It’s also going to ask what your walking stride length is, and your running stride length. I imagine that, like almost the entire population, you don’t have these figures at hand, but that’s OK, you can input these later. Until you do, the Fitbit uses an estimate based on your gender and height. Two notes before I move on. The Fitbit works with both Macs and PCs, and you can specify whether you want to use Imperial or Metric measurement. Once the setup is done, you’re good to step out. The Fitbit is about 90% charged out of the box. Each time you dock the Fitbit to your computer the charge is topped up. Charging is quick, and you get a lot of time out of a charge. Fit claim “The battery will last a minimum of 3 days between charges. The typical user’s experience is 5-7 days”, and that seems about right to me. While we recommend you sync your data regularly, the Tracker can store up to seven days of detailed, minute-by-minute data, as long as it has minimum battery power. It will also store daily totals (calories, distance, and steps) for the trailing 30 days, but without minute-by-minute stats. So your profile is up, your Fitbit is charged. As long as you are wearing the Fitbit, then footsteps, flights of stairs and sleep is recorded. And I repeat, the Fitbit can be clipped to clothing or placed in a pocket. I’d recommend not clipping the Fitbit to clothes that are too thick. The Fitbit is a u-shaped device with somewhat flexible ends, but over time there is a chance that you could place stress on the plastic, and snap the plastic. Instead use the clothes clip, supplied with the Fitbit. This black plastic clip looks like it might only be for display purposes upon opening the box, but don’t throw it out, you should use it if you choose the clip the device to your clothing. To upload the data collected to your website profile, all you need do is have the base station connected by USB to your computer, and then have the Fitbt be within 4.5 metres (15 feet) of the base station. I found this to lag sometimes, either by uploading wirelessly or by connecting my Fitbit to the base station, but don’t worry, the data does get in there! There are two things I really like about the Fitbit. One, is the ease of use. The other, is the way in which it displays your data. Login to the Fitbit site, and move to the Dashboard. Here is displayed all of your data, displayed by default as the current day, but there’s another tab to display your historical data. Along with steps and floors climbed, you are able to set a weekly goal. The default is goal is 10,000 steps daily, which I recall was touted as what we should all approach as a minimum figure in our modern, more sedentary world. You’re also able to log in the food you consume during the day. That way you can see how much you put in by way of calories, and how much you burnt via your base metabolic rate, and your daily activity. You can use the Fitbit site’s food look-up database, although it is very USA-centric. There is the ability to add your own caloric numbers for the foods you consume, either by information from food packaging, or you can purchase a calorie count book for about $8, which lists Australian foods and brands. Or there are online resources listing local food data. While the data entry of food can be a little painful, once you’ve added a food, either by using the Fitbit database or adding manually, the food is then on a list below of food you eat often, so if you’re eating a few foods regularly they are only a click away on the same page – no need to lookup. The Dashboard will also show the list of Badges you’ve achieved. Badges are awarded for daily steps at the minimum of 10,000 steps, and then in increments of 5,000. Badges are also awarded for daily number of floors climbed – one for the daily target of 10 floors, and then in increments of 5. Along with the daily badges, there are also lifetime badges awarded – 250 miles travelled, 500 Floors climbed, and so on. The simplicity of use, and the gamification of exercise, is the real win with this device. The Fitbit designers have seen how users love the gamification aspect of games and services such as Farmville and Foursquare, and aligned this with breaking down a big exercise project via goal setting behaviour. You’re set a daily task, and you can also plug in a long-term goal. Fitness experts have long preached the power of goal-setting, and it is something the Fitbit system does very well. How accurate is the Fitbit? It’s all very well to be easy to use, and to have a great interface to inspire you to exercise more, but accuracy is absolutely key, and in this there is good and bad news. Fitbit claim a 95-97% accuracy for the Fitbit. For counting steps I would go along with that. When I multiply the number of steps for a known distance by my stride length, it pretty much equals what I know to be the distance. So far, so good. However, the distance given by the Fitbit display itself is problematic. To demonstrate this, last Saturday I walked 40,698 steps. My stride length, is 0.8 metres. Multiplying 40,698 times 0.8, should give a distance of 32.558 kilometres. What the Fitbit gave as my distance that day, was 52.98 kilometres. On that, it would look like what the Fitbit is doing is dividing the number of steps taken by the stride length, rather than multiplying. It’s not an exact reversal of the equation, but it’s close. Also problematic, is the counting of floors climbed via the Fitbit’s altimeter. This figure is obtained not only by walking flights of stairs, but also by any hills you might climb in your walk or run. On the same day I did the 40,698 steps, I was also accorded 52 floors climbed. The walk I did, was very flat, and I climbed very few stairs at home. A few weeks ago, I took a 600 kilometre drive, and then back again a few days later. The Fitbit did a good job of not awarding me any steps I didn’t take through vibration of the Fitbit in my pocket or on the car seat, but on the trip down, and on the trip back, I was given a figure in excess of 50 floors. A follower on my Twitter account had a similar experience with a flight. Due to turbulence, the Fitbit recorded 4,000 steps while she was in the air. Fitbit’s solution to these problems is to log in retrospectively, and, on the days in question, visit the Log Activity section of your Fitbit web profile, and mark the time of day driven or flown, and any ‘phantom’ data will be removed. It would I think be preferable to turn the Fitbit off in such instances, but this is not an option, the Fitbit is an always-on device. So just know that going in, that while the recording or steps taken is very accurate, the measuring of distance and counting of floors have their issues. With the use of an armband (supplied as part of the package), and setting the Fitbit in Sleep mode by holding down the button for three seconds, the device is placed in Sleep mode for the purposes of measuring the length and quality of your sleep. I’m not a sleep doctor, but I have been sleep tested, and there was far more involved than simple measurement of my movement as I slept. Still, if you’re looking at improving your general fitness it’s important to get the right amount of sleep, and if nothing else the Fitbit and its inbuilt accelerometer do provide a good estimate of the amount of sleep you’re getting. So yes, the Fitbit does have a few issues that I can see, But go right back to the top of this review – “The Fitbit Wireless Activity Tracker is, at its core, an electronic pedometer”. It does count steps very well. While aspects like the floors climbed and sleep assessment would be nice add-ons, I don’t need them, what I really want to keep a track of is my footsteps. Add to this the ability to show me how (hopefully) much more food that I’m burning than consuming, the graph displaying my daily steps, the badges for my achievements, and the all important smashing of the 10,000 steps per day, I think the The Fitbit Wireless Activity Tracker is an excellent fitness gadget. How much do I like the Fitbit? From being too busy, or too tired, to exercise, this little piece of pretty smart plastic has me walking – on purpose, not just walking around the house – 95 kilometres a week. That’s proper kilometres, not what my Fitbit is saying I’ve done! Thanks for reaching out regarding Fitbit, we enjoyed reading your review. While we launched in 2008, we have worked hard to make Fitbit the best device we can. That said, we have experienced some manufacturing issues that have held up distribution in the US. We are currently focused on filling all US orders at this time and expect to be fully shipping by the end of June. There are wireless technology distribution tests we must pass in every country before shipping/distributing and we decided to focus on US tests first. We do plan to ship internationally in the future. Cut to 2012, and nothing has changed. However, the Fitbit can be purchased from Amazon, which is how I bought my Fitbit… I bought two actually. Additionally, the availability of the Fitbit iPhone app is still limited to I believe only the US and UK. That’s not to say you can’t be from a place other than the US or UK and buy one. You can buy the Fitbit Ultra online at Amazon. The US price is $99.95 RRP, thought it’s a little cheaper than that on Amazon. Mine arrived 4 working days after I ordered it. I would have had it quicker had I arranged delivery to a private address rather than a business address. How long does a Fitbit last? nPower PEG – you are the power! Great pedometer. But really disappointed with FitBit’s attitude to Aussies. They are happy to have Amazon sell you one, they are happy for you to sign up for the paid subscription service but they won’t let us install the Android app. Hey Peter, thanks for dropping by and leaving a comment. Yes, Fitbit did nothing much for me. I asked for a sample to review, and they couldn’t have been less responsive. As you say, it’s not a part of the world they are interested in. So given that they’ve been around since 2008, and that they said to me in 2010 that “we have experienced some manufacturing issues that have held up distribution in the US”, and here we are in 2012, you’d have to doubt Fitbit’s geo market will ever expand to here. There are ways to get the app, but, for me, it’s not that important a part of the system.